January 18 is the anniversary of the death of Charles Ponzi in 1949. Bernard Madoff’s $50 billion swindling operation was described as the largest Ponzi scheme in history, and it's only appropriate to draw attention to the original Ponzi schemer—Charles Ponzi. 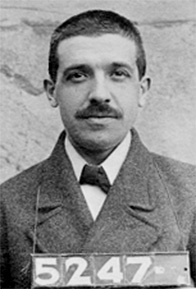 Born Carlo Ponzi in Italy in 1882, this natural rogue dropped out of the University of Rome in 1903 and headed to America to make his fortune. He worked as an assistant teller in a failing Canadian bank that catered to Italian immigrants and used the money from new accounts to pay off interest payments of bad real-estate loans. He later became a check forger and immigrant smuggler and spent five years in prison before finally making his way to Boston in 1917. Always keen to find a get-rich-quick scheme, Ponzi fell upon an unglamorous but shrewd investment loophole. Nine years earlier, in 1906, the Universal Postal Union congress in Rome started issuing international reply coupons (IRCs)—vouchers that could be sent to a participating foreign country in lieu of a self-addressed stamped envelope that a recipient could exchange for local postage to send a reply. Ponzi realized that American inflation after WWI resulted in postage in Italy costing far less than its equivalent in America, which meant that IRCs purchased cheaply in Italy could be cashed in for stamps in the United States and then sold at a tidy profit, all perfectly legally. Of course, to make real money with the system would require millions of coupons to be purchased and traded in for millions of stamps to be sold. Ponzi needed a few saps. Ponzi was dapper and charismatic, and his slogan of a 50 percent return on investment in ninety days attracted enough early interest to get him rolling. He formed the Securities Exchange Company and paid back initial investors handsomely with funds from later investors, which led to a flurry of investment from regular Joes hoping to beat the system. Between December of 1919 and August of 1920, a mere eight months, he had collected around $8 million from more than 10,000 individuals investing their life savings, mortgaging their homes, and reinvesting earlier earnings instead of cashing out. Meanwhile, Ponzi had never purchased a single coupon. What he did purchase was a mansion, a limousine, and passage for his mother to come from Italy to the land of opportunity. There were eventually a few skeptics, including some investigators from the Boston Post, Clarence Barron (the financial analyst for the Barron’s financial paper), and a number of state officials. It was Barron who revealed that Ponzi’s company would require 160 million postal coupons to cover all investments—while the United States Post Office confirmed there were only 27,000 circulating, with none being bought in serious quantities in the United States or Italy. In August of 1920, federal agents raided the Securities Exchange Company and found no coupons. Ponzi was arrested, pleaded guilty to mail fraud, and spent three and a half years in federal prison before facing a nine-year state prison sentence. He quickly jumped bail, fled to Florida to set up a property scam, was deported to Italy where he was less successful as a swindler, and finally died penniless in a Rio de Janeiro charity hospital in 1949. The term Ponzi scheme is generally an American usage. Elsewhere in the world, it is almost always described as a “pyramid scheme,” although there are several important differences, the most important of which is that pyramid schemes are often quite explicit in their admissions that new investors will be the sole source of payout for early investors (i.e., a portion of each new investor’s money is directed to earlier investors, who cash out of the system). The problem with this exponential model is that it is unsustainable, and the funds generated by new participants are soon vastly outpaced by the number of earlier investors expecting payout, at which point the system crashes. In contrast, a true Ponzi scheme requires that the schemer be directly involved with every investor, usually under the guise of some innovative new investment approach, and there have been many, both before and after the rise and fall of its namesake. In 1880, Sarah Howe opened the bogus “Ladies Deposit” in Boston promising 8 percent interest “for women only” before she vanished with the money. More than 100 years later, Louis Jay Pearlman ran an extraordinary Ponzi scheme in the 1990s in which he bilked more than $300 million from individuals investing in the fictitious Trans Continental Airlines, Inc. (though his greater crime against humanity is surely the fact that he was the one-time manager for American boy bands ‘N Sync and the Backstreet Boys). Since Ponzi’s day, the selling price and exchange value in stamps for international reply coupons have been adjusted to remove the potential for profit that he exploited. Regrettably, no similar regulations exist to remove the potential for profit from boy bands.